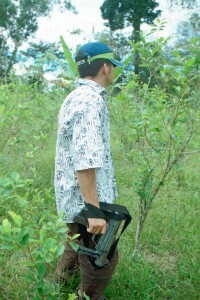 Gunman guarding coca crops (materia prima for cocaine) in southern Colombia. © Photo by Steve Salisbury. All rights reserved. That said of FARC cohesion, there is a varying degree of autonomy in the FARC ground units known as “fronts.” The “fronts” have to obey FARC Secretariat and Estado Mayor Central leadership orders and guidelines, but how the “fronts” carry out orders and guidelines can have some flexibility and creativity at times. And there have been cases where FARC “fronts” haven’t informed everything to the high command—whether unintentionally, or due to communications technical disconnects, or intentionally because they feel that the Secretariat could reprimand them over something. According to a FARC source, when the FARC’s late founder “Manuel Marulanda” ordered an investigation to find out what happened in the killing of Uribe’s father, FARC units responded that they couldn’t find out anything, in that area where a number of armed groups operated. However, a FARC investigation into the execution-style killing of African-descendants rights activist Genaro Garcia last August 3—initially denied by the FARC’s “Comandante Alfonso Cano Western Block,” which had said in an August 16 communique that it wasn’t its organization’s policy to attempt against the life of social and political leaders—found that “the death of ethic leader Genaro Garcia disgracefully compromises our units,” tweeted FARC Secretariat member and peace negotiator “Pastor Alape” about eight or nine days later. Garcia had reportedly received alleged threats since October 2014 from elements of a FARC “mobile column” that if he continued his activism for peace zones free of combatant forces and against drug interests that he would be killed. “There will be justice,” “Pastor Alape” said in his tweet. While there may be some degree of grumbling from time to time inside FARC “fronts” (which happens in about every military or guerilla organization), it is not “dissidence” per se. The FARC’s response to internal dissidence or rebellion can be “the most drastic,” a FARC peace negotiator told me. Drastic measures could include execution after a FARC “war council” tribunal process. What if a FARC “front” were to try to go rogue? If that were to happen, then the FARC’s “mobile columns” could be dispatched to put the rogue “front” into order, this FARC peace negotiator said. The Western official (cited above), who follows the peace process, doesn’t discard the possibility of potential FARC dissident groups continuing to fight against the government after an eventual overall peace accord is signed. But he says that he thinks that the FARC will remain cohesive at a high extent. Because if someone inside the FARC tries to get out of line, “he gets killed,” said this Western official, although FARC organizational statutes have an array of disciplinary measures. And FARC wartime “drastic” measures would by definition have to end in its peacetime mode. The above doesn’t necessarily mean that there won’t be some splinters or individuals of the FARC who go into a “post-conflict” phenomenon of organized criminal activity, perhaps with some veneer of political motivation. And, given that society overall has a fractional percentage of common criminals, it is almost inevitable that some individuals of the FARC may peel off into individual criminal activity, not as part of any organization, in a post-conflict. What percentage(s) of the FARC may splinter off into organized criminal groups or into individual common crime, or could be siphoned off by the ELN, if not continuing as a new guerrilla movement against the state, after the signing of an eventual overall peace accord between the Colombian government and FARC? It is impossible to put a precise figure on that because there is no comprehensive scientific surveying of this question—just anecdotal guesstimates—but one could surmise that it would be lower than that of demobilized Colombian rightist outlawed “paramilitary” groups, given FARC cohesion, discipline and ideological structures. According to reports of Colombian government reintegration agencies, up to 25% of demobilized “paramilitaries” had some kind of brush with the law after demobilization, and up to 10% were estimated to have “recycled” into BACRIMs. 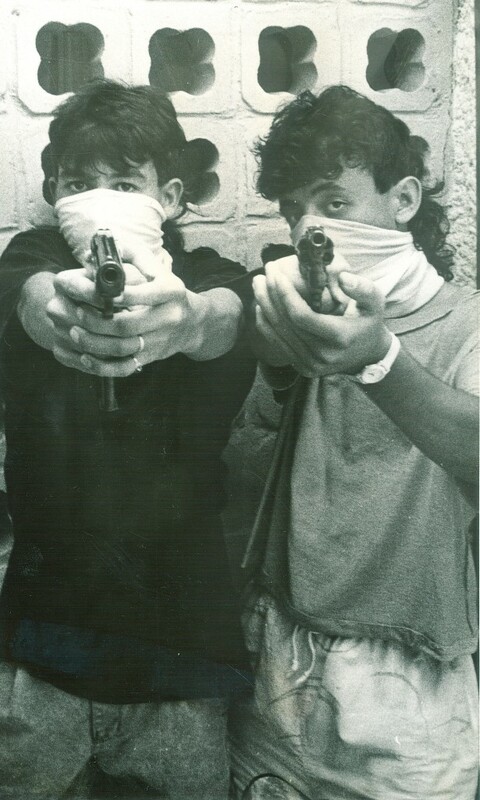 Teenage “sicarios” (“hit-men”) in Medellin in 1990. Worries for Colombia’s post-conflict include the possibility of rising crime by either gangs or individuals. © Photo by Steve Salisbury. All rights reserved. The FARC’s “Timochenko” told SEMANA magazine that 100% of the FARC’s “fronts” would incorporate into civilian society, but that there could be one percent of guerrillas to fall away. “I don’t discard that one or another ‘muchacho’ may stray. That is normal,” he said. There is no concrete evidence of particular FARC “fronts” being out of control of the FARC high command. But a rancher who sees FARC guerrillas pass at times through his properties in central or southern Colombia says that there is a bit of “uncertainty” among FARC rank and file about what will happen to them after an overall peace accord materializes. They are worried about their personal future. There is a bit of tough talk among some that they can continue to fight on, if need be. But that could just be natural bravado for internal consumption. The rancher, who has lived through the Colombian conflict for decades, told me that if the peace negotiations produce a good, solid deal that takes care of FARC members to their satisfaction, or at least to an acceptable degree, then about all of them would follow their leaders on it. But if not, there could be significant splintering. The rank and file have confidence and hope in FARC leaders’ negotiating abilities, indicated the rancher, but the rank and file still await what the final result will produce. If an overall peace accord wasn’t acceptable to them, some wonder if there may be a phenomenon of what could be called “FARCRIMs,” similar to BACRIM groups, even perhaps forming alliances with BARCRIMs. Precautions by the FARC leadership to prevent any internal rupture or splits have included “educating” the FARC rank and file about the peace talks, with visits to FARC “fronts” by FARC emissaries and by continual radio, internet and other communications means. Commanders and political commissars of every FARC unit have a responsibility to keep FARC troops informed. FARC Secretariat member “Joaquin Gomez” flew with assistance of the International Committee of the Red Cross and permission of the Colombian government from Havana in January reportedly to make a two-week trip to his area of command in southern Colombia precisely to update the rank and file. Colombian Interior Minister Juan Fernando Cristo said in El Tiempo newspaper: “This is a screw-up of the FARC in face of the confidence that the government and a good part of the Colombian population have generated toward it,” noting that the FARC had fulfilled government conditions in the four previous visits to other areas and that the “abuse” in Conejo feeds critics of the peace process. The mayor of the southern town of San Vicente del Caguan, Humberto Sanchez, reportedly said that the FARC’s “El Medico,” “Romana” and “El Paisa” had carried out proselytizing with armed guerrillas in the village Brisas del Diamante February 6, but that didn’t cause a government stir at the time. The FARC leadership responded that it didn’t see talking with civilians about the peace talks as “armed proselytism” or as something prohibited in the protocols for such visits. The FARC called on the government to chill out and surmount this episode and condemned “an unjustified controversy raised by the most noted spokespersons of the war-mongering right-wing,” presumably referring to Uribistas and strong peace-process critic, Alejandro Ordonez, Colombia’s Inspector General (Procurador General) on public-service disciplinary matters, among others, who blasted the FARC visit to Conejo as a threat to Colombian institutionality. Other FARC measures to prevent internal rupture are to keep FARC members active in political and cultural training and civic-action. One FARC peace negotiator told me that a big factor for the FARC to keep control of its members in a post-conflict is to canvass and register where they live and what they do and to harness them into productive activities to further FARC goals as a legal political/social movement. According to a high-level international humanitarian diplomat, the rank and file and middle levels inside the FARC and Colombian government security forces are not prepared yet, for absorbing an eventual overall peace accord/”post-conflict. Changes of mindsets and attitudes, as well as extensive educational efforts, appear to be needed by the forces of all warring entities and Colombian society in general, said the humanitarian diplomat. A US official, reflecting speculation I heard separately some time ago by Colombian high-ranking officers, thinks that the FARC, once entering the legal civilian world, could perhaps have some sort of surreptitious connection to “residual” armed or unarmed groups which would allow the FARC supposed access, with plausible deniability, to possibly benefiting from things like illegal drug revenues and maybe to pressure covertly for its political goals. The FARC leadership rejects this possibility as false speculation from recalcitrant elements in sectors against the peace process. When the now-defunct M-19 guerrilla movement demobilized, a quite small fraction of its combatants apparently moved into the FARC or ELN. Maybe some FARC combatants who wouldn’t want to give up guerrilla life now could think of going into the ELN. But what would they gain starting anew in another organization, especially given that the ELN started its own preliminary, exploratory peace talks, even if the ELN talks are currently on the rocks?